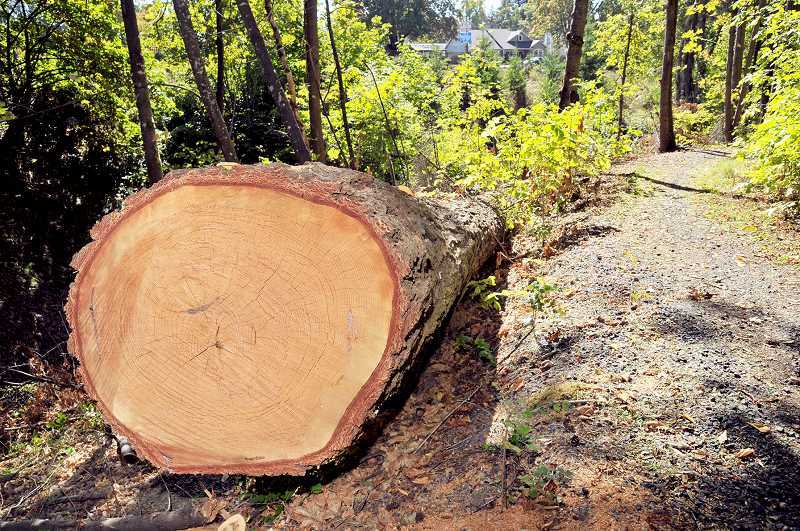 George Fox University's plant services department and Portland-based contractor General Tree Service fell 26 "problematic" trees on campus during the summer. Those passing by the campus, especially at its southern end near Highway 99W and across from Hoover Park, will notice in some areas of the canyon that large debris piles and several large tree trunks remain. Although it may appear like an unfinished project, GFU arborist Carl Anderson says otherwise. "Placement of logs and debris is a valuable erosion control method and will return nutrients to the canyon floor," Anderson, who served as project manager, said in an email interview. "We plan on using many of the logs in our ongoing upkeep and restoration of the canyon." He added that the decision to raze the trees "was fairly easy" for the plant services staff because all of the trees had died over the past few years and needed to be removed. The project was undertaken in order to maintain a safe environment and to remove the trees before advanced decay set it. As for the trees in the south end of the canyon, Anderson said, "it is very labor intensive to clean up a project as large as this and there was simply not time this summer. Our summer priorities are given to projects related being ready to start the new school year." By observation, the trees may have looked fine from the outside, Anderson said, but were in fact already hazardous. "The two main causes of death were drought and construction damage to the roots of the tree," he said. "Both of these types typically do not cause structural damage to the tree that would be evidenced by advanced decay or large wounds." In addition to the trees that were felled were four that were topped to remove dead or extraneous limbs to create a "wildlife snag." "A wildlife snag is simply a tree which has been left standing after it has died," Anderson said. "As the wood rots, insects start to bore into the tree, then birds go after the insects eventually creating nests inside the tree. When the top breaks off of the tree, it provides a space for raptors to build nests. Since most of our dead trees are in locations where there would be too much risk in leaving them to fall apart, naturally we remove the tops." The wildlife snags are located near both bridges across the canyon and along the trail below the Wheeler Sports Center. Those familiar with the GFU campus might remember a large oak tree near Minthorn Hall that nearly struck Brougher Hall when it suddenly fell. The primary culprit for the toppled tree was a fungus in the Armillaria genus, one that commonly affects Oregon oaks, but Anderson also mentioned over-watering. "Any excess watering in one year or another does not have a significant effect on the tree," he said. "It is the cumulative effect of watering the lawns during the last 30 to 40 years." When lawns are kept green throughout the summer, the natural cycle of drought is interrupted and the fungus is allowed to take hold of the tree and spread quicker. "As the campus arborist, I keep a list of trees that need to be removed and ones that we are watching because they show signs of decline," Anderson said. "Each of these trees are evaluated individually based on benefits and the risks it poses." Anderson said that he does not anticipate more big removal projects any time soon, but he and the plant services staff will continue to remove trees as needed for safety.